Northwoods is a rapidly growing software company that serves human services agencies across the country. When you work at Northwoods, you are part of a team that is passionate about our customers and our ability to truly impact their lives and the lives of the most vulnerable in our communities. You feel good knowing that by working here, you are helping families in need, protecting children from harm, and making the world just a little bit better. At Northwoods, our people are the core of our culture. We are thoughtful about who we hire, and we spend a lot of time developing meaningful relationships among coworkers. We care deeply about our work and about each other. Our common drive and shared values are invigorating. We love to come to work each and every day (seriously!). Our work environment is anything but “corporate.” We dress casually and enjoy each other’s company. We treat one another like family, which means that along with working hard together, we also eat, laugh, and play together. Whether it is hanging out on our patio eating lunch, playing a competitive game of table tennis, or having a drink in our bar (nicknamed the Grizzly), we purposefully invest time in getting to know each other! Being accountable for your work and to your team is more important than when and where you get your work done. Be a part of a team that gives back to the community and has a purpose greater than itself. We work together to provide innovative solutions for our customers. Since Northwoods is all about human services, it probably won’t surprise you that we encourage a strong culture of helping others. We offer employees company time to volunteer in efforts together and for causes near and dear to their hearts. 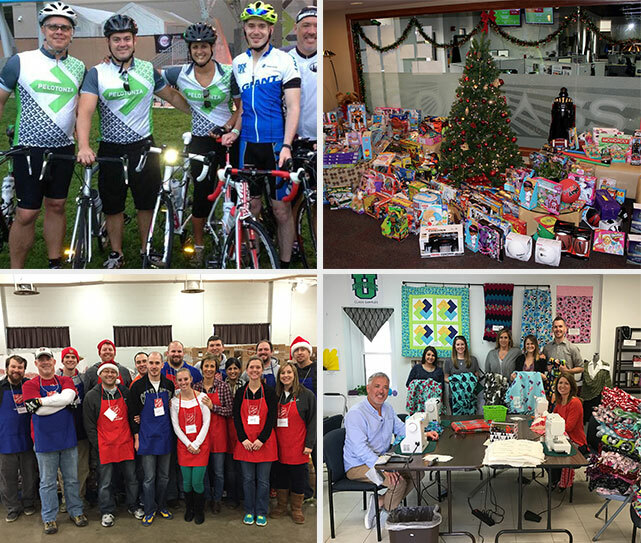 ​Our employee-driven Northwoods Foundation, a 501(c)(3) not-for-profit organization, is another important way we give back to people in need in the communities in which our employees work and live. Northwoods believes benefits should make a difference in your life. Northwoods recognizes that it’s not always possible to control how much time you might need to take off in a given year. That’s why we do not have a traditional PTO plan. Team members have flexibility to take the time they need to have new experiences, make memories, or recoup from the flu. It’s all about communication and being accountable for your work. We have a purposefully flat organizational structure (as well as low turnover). We still want to provide opportunities for Northwoodians to grow, develop, and be recognized. Through our “Grow Like a Ninja” program, you can earn rewards such as bonuses and sabbaticals for learning, knowledge sharing, and making other valuable contributions to Northwoods. While traditional benefits may not be exciting, they make a big difference in the lives of our team. Northwoods’ Wellness Committee offers a variety of incentives to make feeling healthy fun and easy on your wallet! Also, join your coworkers in our on-site gym for a quick workout before work, at lunch, or anytime. Growing your family is amazing and we want you to take the time you need to bond with your new family! We offer paid parental leave so that new parents—mothers, fathers, partners, and adoptive and foster parents—are able to take time off from work without missing a paycheck. Northwoods offers a variety of health plan options, including an HSA, as well as dental and vision insurance. Northwoods offers both health and dependent care FSA options. We want to help you plan for the future. Northwoods offers a generous match when you invest in your retirement. We hope you never need it, but we offer 100% employer-paid basic life and AD&D insurance, short and long-term disability coverage, and long-term care coverage. Northwoods is a rapidly growing software company in Columbus serving human services agencies across the country. If you seek a collaborative team, unique challenges, and the chance to contribute to work that matters, Northwoods is the right place for you. Sure, we hire software developers and sales and business professionals in IT, but most importantly, Northwoods hires smart, dedicated, and passionate people who want to make a difference in the world! If Northwoods is right for you, check out our job openings.